Gordon Hayward featured in the 2010 edition of Sports Spectrum. Sitting in a parent seminar on the eve of the NBA draft, Gordon Scott Hayward couldn’t help but look around. He didn’t belong in the conference room at the Westin Times Square. And he knew it. Gordon Scott, the father of No. 9 Utah Jazz pick Gordon Daniel Hayward, was clearly the shortest father in the room, as he and his wife, Jody, stand a mere 5-foot-10. It was obvious where the other draftees’ height had come from: their parents. Not so with their 6-foot-8 son, however. His height came from someone else. “I tell people, ‘If you don’t believe in God, and you look at Gordon’s story, and still don’t believe in God, then you aren’t paying attention,’” Gordon Scott says. In high school, Gordon Daniel went to bed every night praying that he would be 6-foot-4, his doctor’s maximum height prediction. His driver’s license, in fact, still says 6-2, 140 pounds, hardly Division I caliber, nonetheless NBA prospect. Because of his puniness, he almost quit basketball after his freshman year on Brownsburg High School’s JV team to solely focus on tennis. Gordon Daniel miraculously sprouted to 6-foot-8 and became a Hoosier star, leading Brownsburg High School to a Class 4A state title during his senior year and signing with mid-major Butler University in Indianapolis. At Butler, he had an exemplary coterie that included Christians Ronald Nored (point guard) and Brad Stevens (head coach). Jody also helped Gordon Daniel stay grounded, tex- ting him the acronym “RWYPF” before every game. “Remember Who You Play For” he would be reminded. 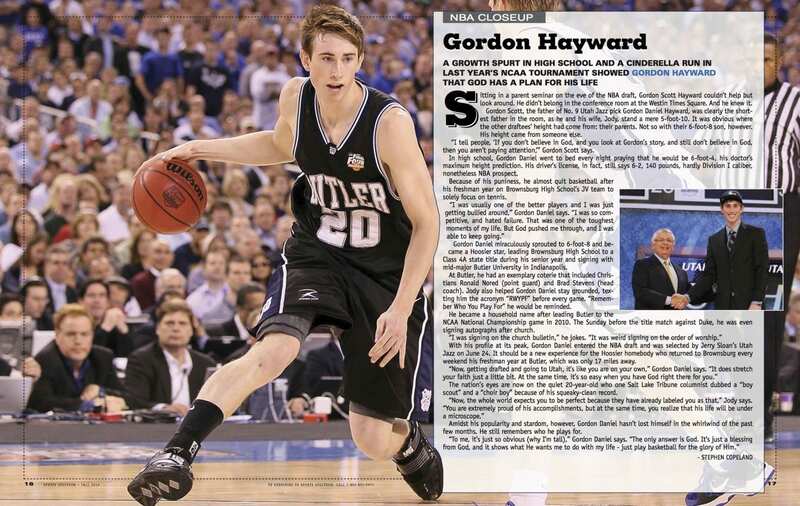 He became a household name after leading Butler to the NCAA National Championship game in 2010. The Sunday before the title match against Duke, he was even signing autographs after church. With his profile at its peak, Gordon Daniel entered the NBA draft and was selected by Jerry Sloan’s Utah Jazz on June 24. It should be a new experience for the Hoosier homebody who returned to Brownsburg every weekend his freshman year at Butler, which was only 17 miles away. The nation’s eyes are now on the quiet 20-year-old who one Salt Lake Tribune columnist dubbed a “boy scout” and a “choir boy” because of his squeaky-clean record. Amidst his popularity and stardom, however, Gordon Daniel hasn’t lost himself in the whirlwind of the past few months. He still remembers who he plays for. 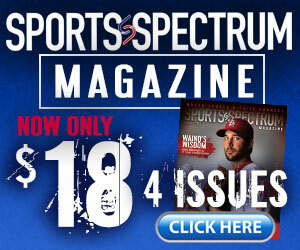 Stephen Copeland is an intern at Sports Spectrum magazine.